For a while, especially after having seen the rather disappointing Pom Poko, I’ve been wanting to see a proper Ghibli movie directed by Miyazaki Hayao. My uncle gave me some money for my birthday, and I splurged on movies, one of them being Studio Ghibli’s most famous flick, My Neighbor Totoro (となりのトトロ, tonari no totoro). My Neighbor Totoro follows Satsuki and her younger sister Mei as they move into the country. There, they meet Totoro, a forest spirit that adults cannot see. My Neighbor Totoro reminded me of Kiki’s Delivery Service in how light its plot was, which I think is pretty atypical of Miyazaki. Two of his earlier movies, like Nausicaa of the Valley of the Wind and Laputa, as well as many of his later ones like Spirited Away, were very heavily plot-driven, but My Neighbor Totoro was much more slice-of-life where we see Satsuki and Mei simply living in their new homes. Interestingly enough, the titular Totoro didn’t even have that much time onscreen. Totoro ultimately was relegated to being a deus-ex-machina whose sole purpose was to advance the plot. I think it’s because he was popular with many of the younger audience members that he became Studio Ghibli’s mascot. I also think Totoro’s minimal presence was a good thing. He didn’t get in the way of letting us see the sisters interact with each other and their situation, particularly with the fact that their mother is in the hospital. The movie was very focused on its characters and how they related to one-another. Unfortunately, the movie had some minor dents in its pacing. To me, it looks like Miyazaki didn’t perfect slice-of-life storytelling until the next year with Kiki’s Delivery Service. 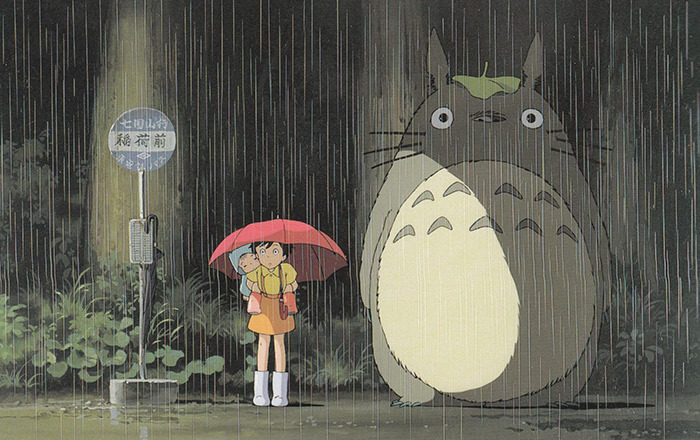 Despite that, My Neighbor Totoro succeeded in being a fun movie for the whole family. It’s cute, poignant, and often absolutely hilarious in ways that would appeal to children and adults alike. As always, we have the usual Studio Ghibli standard of presentation, with the usual top-tier animation and music by Joe Hisaishi. The Japanese voice cast, particularly Sakamoto Chika as Mei, also really contributed to the overall feel of My Neighbor Totoro.